These Hatching Eggs Toys are one of the top selling Toys this Christmas. My daughter had an early Christmas. From the moment she saw the Hatchimals Toys at the shop she wanted one. But then she wants many toys , just for buying them because she only plays with them for a few days and she forgets. 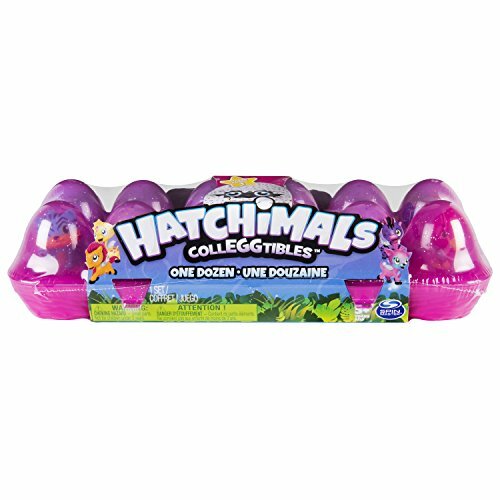 These Hatching Eggs toys, are so popular that some places run out of stock soon after the launch. I am sure they will be amongst the best selling toys this Christmas, so I am glad we got ours early. Our hatchimal toy was a girl, so I will be referring through this post as she, but you could get a boy. You can decide if it is a boy or girl depending on the color and what your child decides. The Hatchimals toys comes in an egg as the title says it. 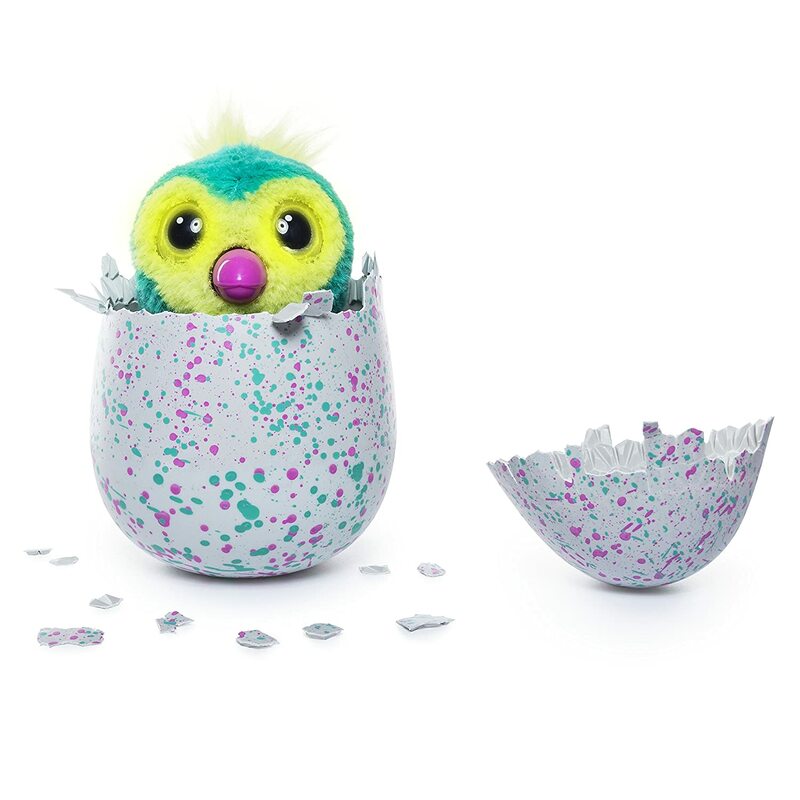 These hatching egg toys have a surprise inside, an electronic animal toy that hatches by itself. 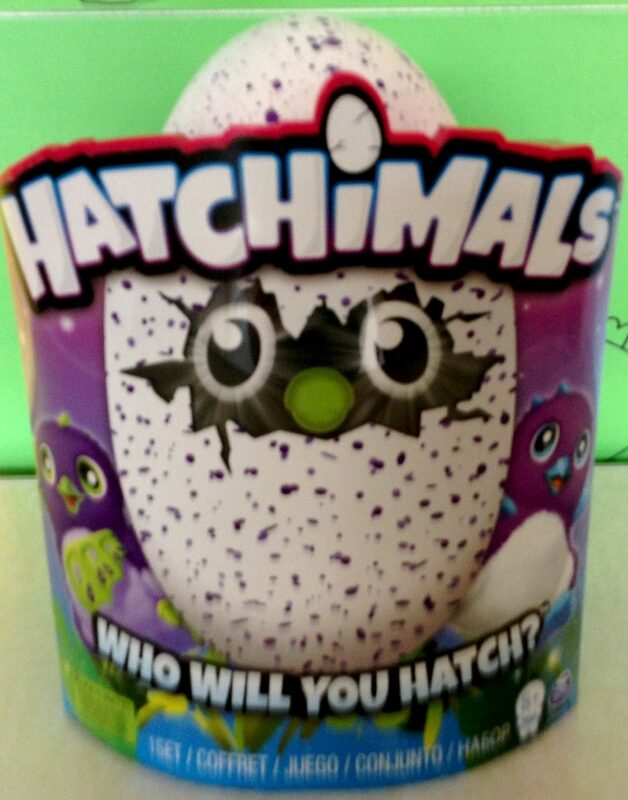 Hence the name they got, Hatchimals. They are not real animals but electronic animal toys that can interact with you. These hatching egg is quite large, unfortunately I did not measure it. There is only one hatchimal per egg, and one egg per box. The exciting thing about the Hatching egg is that you do not know what you get inside. It is a surprise. But I am not convinced about this. Apparently the idea is that the child would not know what he/she is getting, until the egg hatches. You are not supposed to guess. Anyway, she was quite excited with the Hatchimal and she could not wait for the egg to hatch. The whole hatching process is part of the excitement and the adventure. These Hatching egg toys come in a fancy box. There is a pretend egg on the box. We thought it was the actual egg, but it was not. Then you get the egg, and some instructions and manual. The instructions are in different languages. The egg is screwed on some extra packaging. You need to unscrew those and that is when the egg will start talking to you. What color is this Hatching Egg Toy? The hatching egg toy come in different colors. They are all white but they have different color speckles , Ours were purple and blue, but you can get them in blue, green, pink and even light blue. 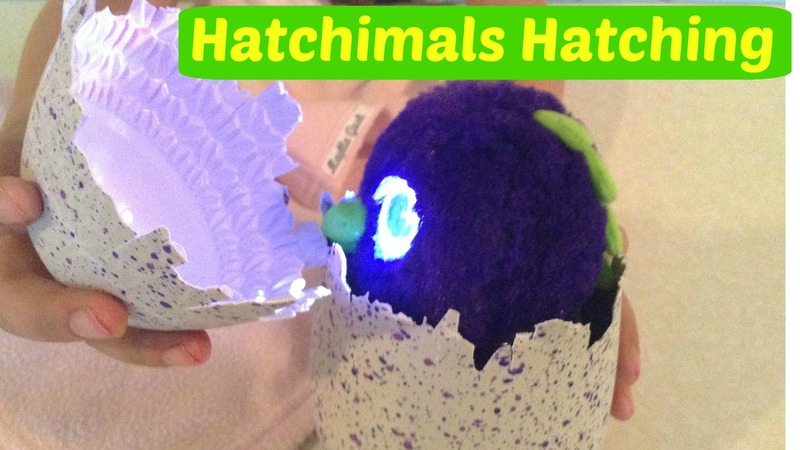 Hatchimals toys are interactive toys. 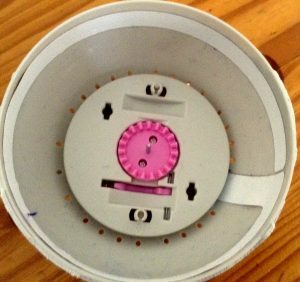 This means that the child can interact and get a response from the toy. Like you can teach the Hatchimal to talk and he/she will respond with words. 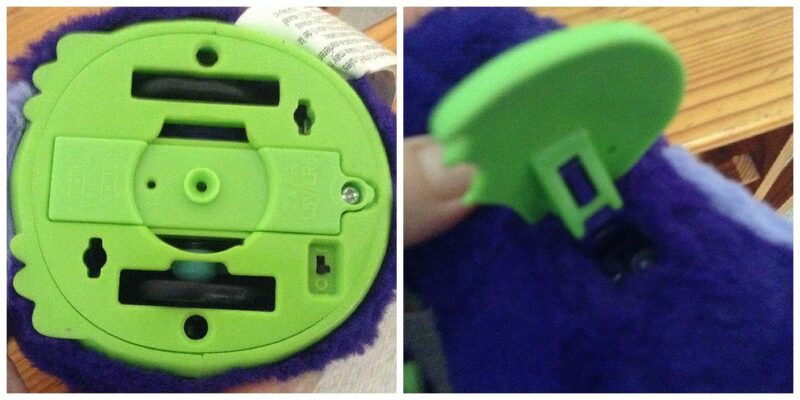 This toy is suitable for kids older than 5 years old. I believe that they said 5 years and older because when it hatches the egg shell breaks in small pieces. But if you are careful and you are next to the egg when it hatches, you can then throw away all egg shell pieces and the actual Hatchimal is safe for a younger child. Anyway, I would not leave a younger child alone with it, as these electronic animal toys need to be treated with care. These Hatching eggs Toys are one of the top selling toys this Christmas. How long does it take for the Hatching Egg Toys to Hatch? This hatching egg toy will not hatch if you do not take care of it. So don’t be concerned that the egg will hatch without you being there. 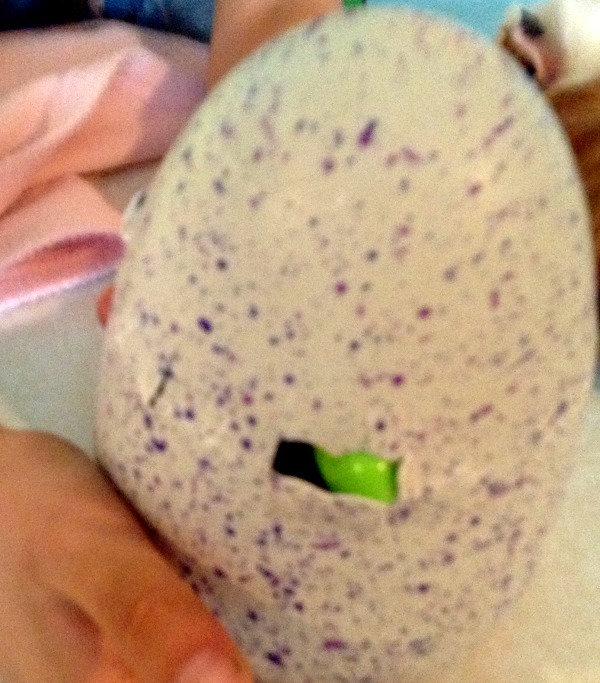 Once you take care and nurture the hatchimal egg, the egg will start hatching. The manual says that it takes between 20 to 25 minutes to complete the process. But ours took longer, or at least it seemed longer. 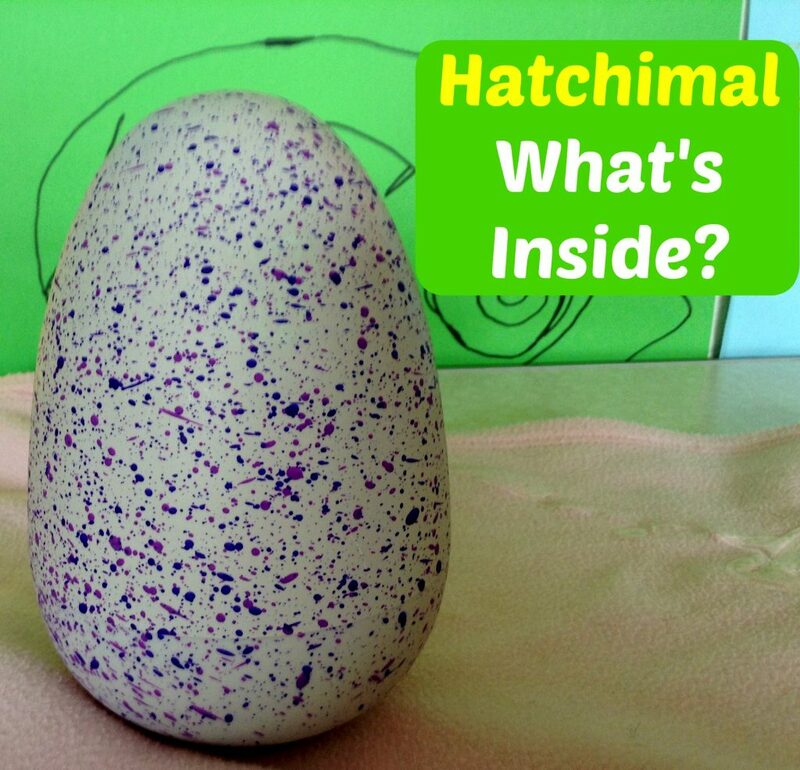 When the egg starts hatching, the hatchimal will go round in circles inside the egg, pecking the egg shell. In our case, sometimes, the draggle (ours was a draggle) got stack and would stop going in circles. Then Maylla just gave her a slight knock at the bottom of the egg for it to start again. It probably got stack because Maylla wouldn’t keep it straight and she was tilting it and moving it around whilst hatching. What is so Great About these Battery Operated Animal Toys? 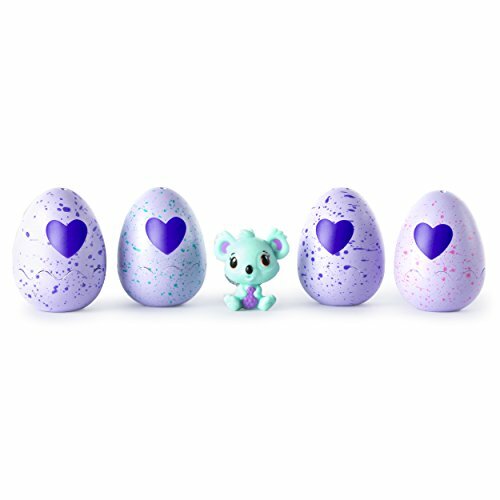 These Battery Operated animal toys, known as Hatchimal, will hatch by itself and you will get a Hatchimal. The toy has 5 stages. There are things you can do in each stage. What can you do with the Hatching Egg in the Stage 1- Egg stage? The baby in the hatching egg can start talking before it hatches, as soon as you get it out of the box and the eyes change color depending on his/her emotions, and you will see it through the egg. If you tilt the egg on its side, the Hatchimal will talk to you. If you tap on the egg, the Hatchimal will tap back, but he/she can only hear you tap when he/she is quiet. You can hold the bottom of the hatching egg toy, to hear her heart beat or to warm her up. If you want to switch off the egg turn the egg upside down. To wake the Hatchimal up hold the bottom of the egg. Even when in the egg, you can see the eye colors. 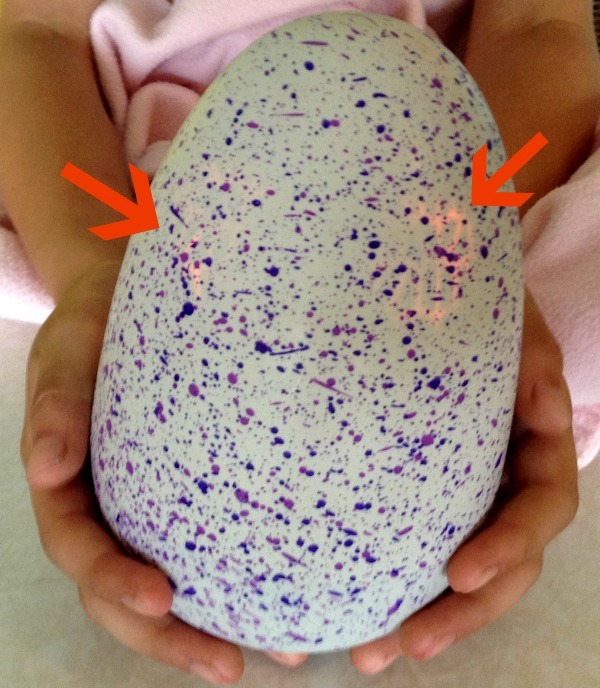 The eye color indicates the emotions of the Hatchimal. Here is a table indicating what it means and what to do. Green I am sick Rub bottom of the egg to make me feel better. 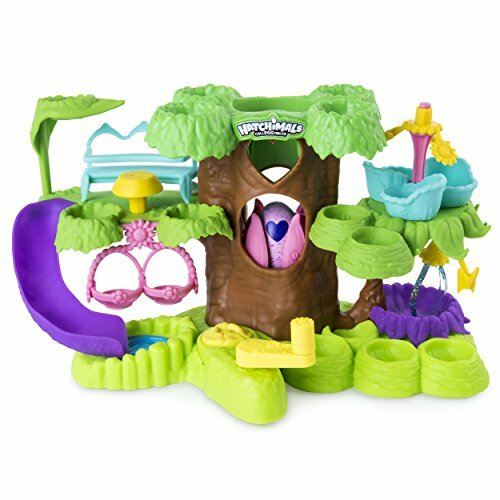 The Hatching Eggs Toys are interactive toys. This means that they will respond to an action that you do. Hatchimals can eat, talk, walk and dance. They also play games with you. There are several kind of interactive pet toys. One other one quite popular is the Tekno Newborn Kitty. 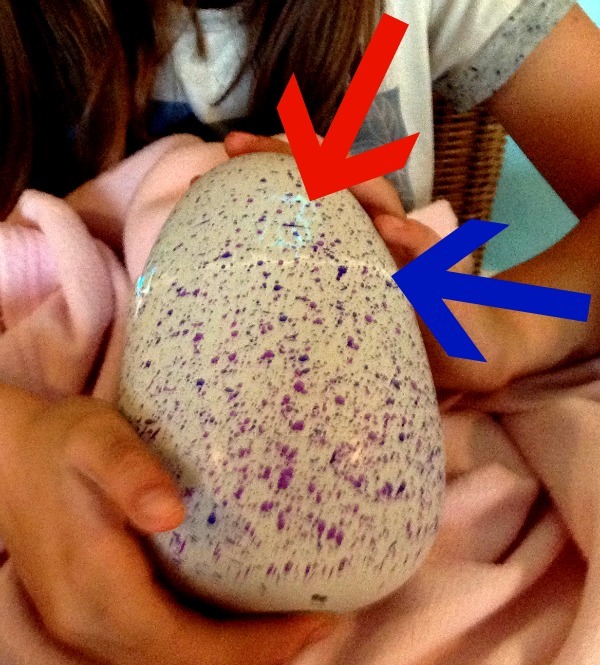 What Happens to the Hatchimal during the Hatching Stage? When you see rainbow color eye in your egg, then the Hatchimal toy is ready to hatch. Yuppee! The hatchimals toys will not hatch without you. You need to nurture it. Hold the bottom of the egg to start hatching. Whilst the hatchimal toy is pecking then the eyes will go white. When she stops pecking the eyes will be rainbow. Below you see an image, I cannot distinguish now the color of the eyes (red arrow), it seems to be a light blue , which means I am cold. In the image below you will see the egg cracking, and you can see the draggle beak. And below is the whole hatching process. As said the instructions say it should take between 20 to 25 minutes, but I think it took longer. Our hatchimal is purple, but in some of the photos it came as blue. You can also watch a video when the egg hatches. Skip to minute 5:41 to hear heart beat and then see it hatch. Once the hatchimal has stopped pecking and you can pull the top part of the egg shell, wait for the rainbow lights. and remove all pieces of shell. We had to remove all parts of the shell till the base of the egg. There is a bottom part of the shell that you cannot break. Once you got rid of all the egg shell, you will need to pull out the hatchimal. Pull strongly I wish I knew what we did exactly. We battled to pull the draggle out. You need to pull hard until you hear a click. The base of the egg has a mechanism that was used for the hatchimal to turn around in circles while pecking. 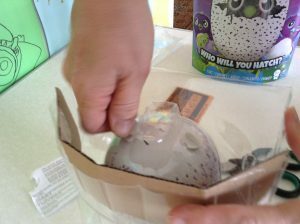 If you accidentally break the hatching egg before it hatches, you will need to remove the Hatchimal toy from the egg. You cannot repair the egg. 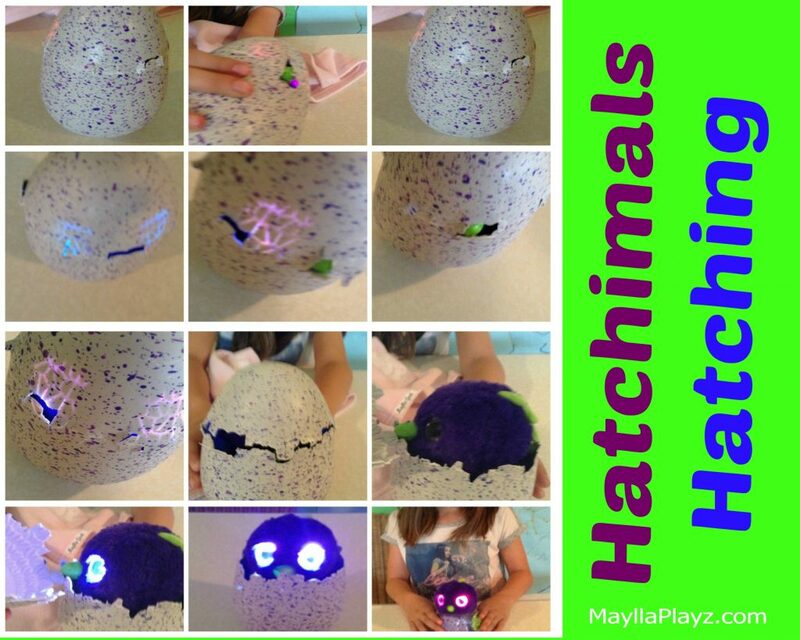 So be careful how you handle this Hatching eggs toy..
What type of Hatchimals Toys Can you Get? There are different hatchimals that you can get, and you do not know what you are getting, but my daughter said she knew what she was getting just from the box. Some of the Hatchimal types you can only get at a specific shop. 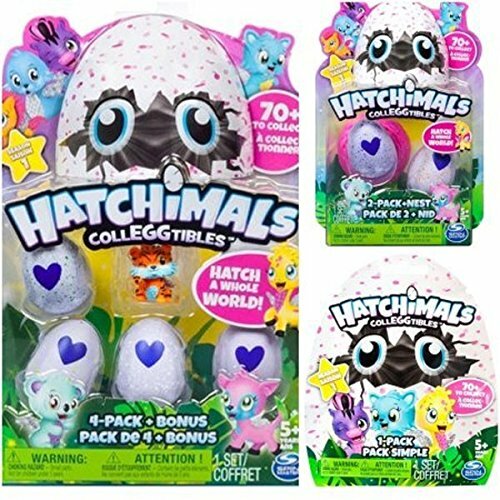 The most common ones are Hatchimal draggles (dragons) and Hatchimal Pengualas (penguins) which you can get at Amazon. 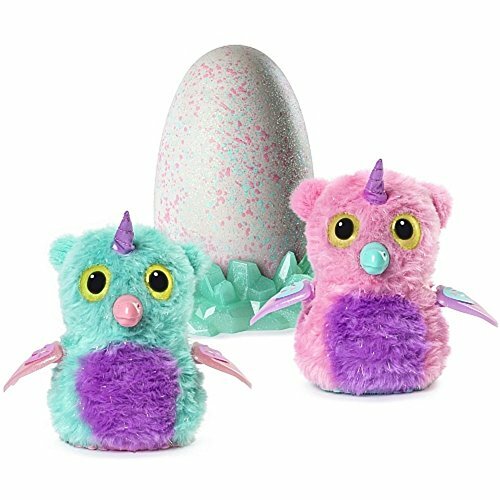 Then you have the Hatchimal owls, which are called owlicorns and you can get from Toy R us. You can get a Hatchimal Burtle at Walmart. ALl these hatchimal toys come in different colors, but you cannot choose the color. The hatchimals are battery operated animal toys. The toy comes with two AA batteries. They suggest you change the batteries after hatching, but we have not yet changed. These are one of the best electronic toy animals of 2016, and is one of the top selling toys this Christmas. These electronic animal toys are cute and they need to be cared for. Do not leave them in the sun, as the color will fade. Do not submerge them in water. Clean gently with a damp cloth. Once the egg has hatched, you get the baby stage. You cannot go back to the Hatching egg stage. During the baby stage you get to play with it and care for the baby. Then you can pass to the toddler stage. During the toddler stage you can teach them to walk, talk and dance. You can play with your hatchimal toy as well. Then you pass to the Kid stage where you can play different games. You can always reset the toy from the kid stage to the baby stage. In conclusion, we were happy to get this toy. Maylla also has some other electronic pet toys, like the Tekno Newborn Kitty, but she loves the Hatchimal most. 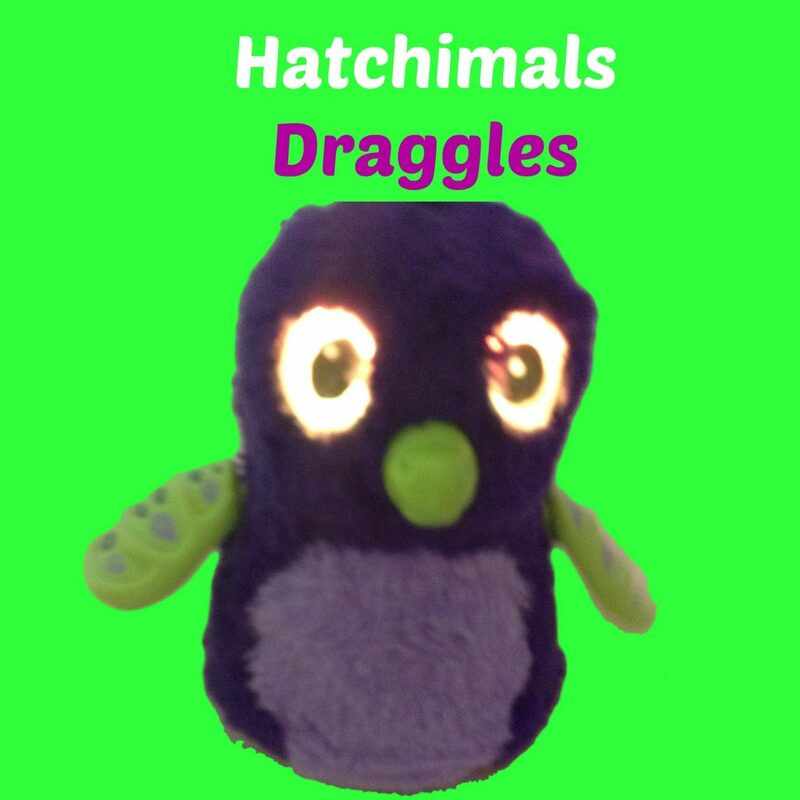 Watch a video of my daughter playing with her Hatchimal draggle. Wow! A lot of great information. A great post! Well done!